When the Night Heron Gallery reopens for the year this weekend, the cooperative will feature the work of three new artists and artisans. Adding to its lineup of eight individuals working in a variety of media will be furniture maker Paul Farrington, ceramicist Heather Goff, and painter and printmaker Elizabeth Whelan. All are well established in the Vineyard art world. Both Farrington and Hall will sell their work on a consignment basis, while Whelan will be a full member, taking on shop-sitting duties along with the existing eight members. “I know she’ll be bringing such great energy to the gallery,” says Farrington. 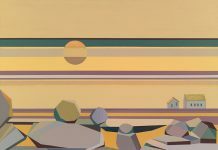 Whelan has experimented in various media ever since the days when she stepped away from a full-time job as a commercial artist onto the deck of a boat, where she lived and worked for many years. The Maryland native has worked variously in graphic design, illustration, web design, commission painting, relief printmaking, and most recently, portraiture. For her upcoming venture, the former boat dweller is returning to her most longstanding passion — painting maritime and nautical scenes. At the Night Heron she will offer a variety of works representing boats and sea scenes, rendered as both paintings and prints. “I am so thrilled to be joining the Night Heron Gallery group,” she says. “I love the intersection of art and artisans. I see myself as somewhere in the middle.” Although her work has covered a variety of themes, including landscapes, still life, and portraits, at the gallery she will focus exclusively on the maritime genre. 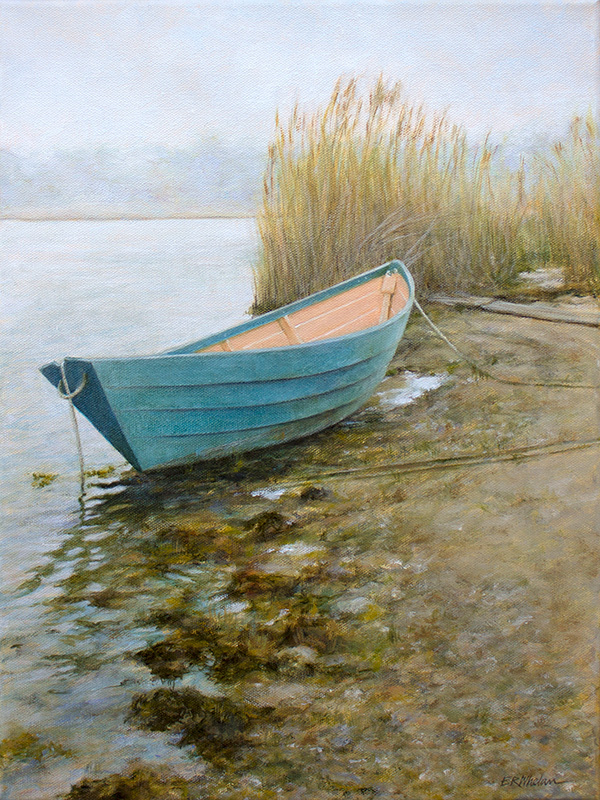 Her first contribution to the Night Heron Gallery was a wonderfully atmospheric painting of a dory resting on a marshy shore in the fog. The painting sold right out of the window display. That early success made Whelan realize that she needed to step up her productivity a notch. The career artist does commission portraits, gives one-on-one private lessons ,and has, for the past couple of winters, run a painting group at the Chappy Community Center. All this while still finding time to indulge her own passion for painting whatever grabs her attention. Along with oil paintings and prints of some of her images, Whelan will offer the output of her etching press — relief prints using carved linoleum and woodblocks. Heather Goff is another artist who is returning to her early interest after a career spent doing commercial work and experimenting with various media. 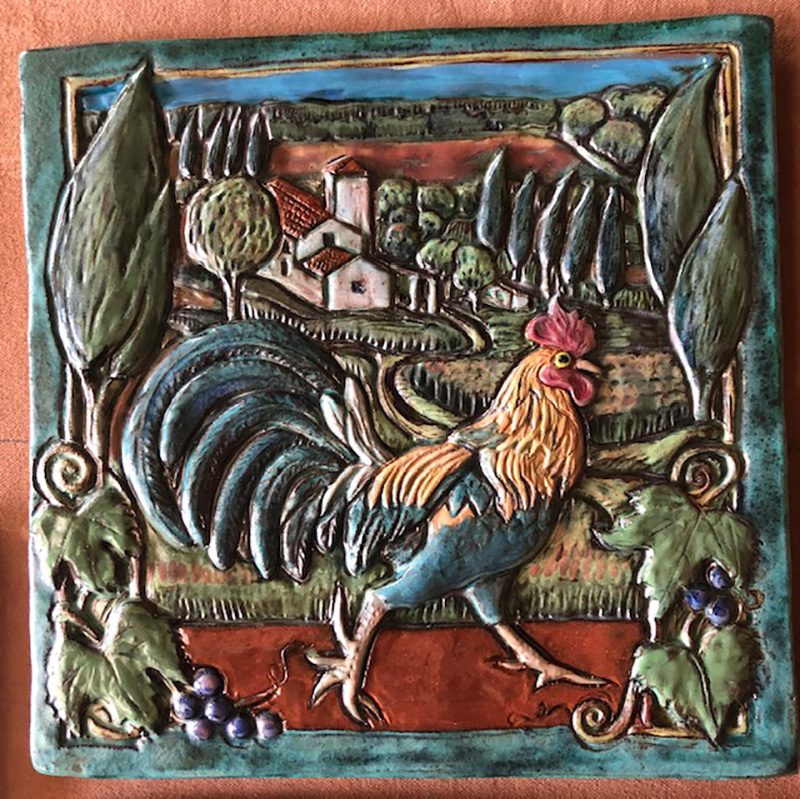 In the 1990s, Goff created a series of charming ceramic tiles depicting farm scenes, flora and fauna, and other images of Island life. 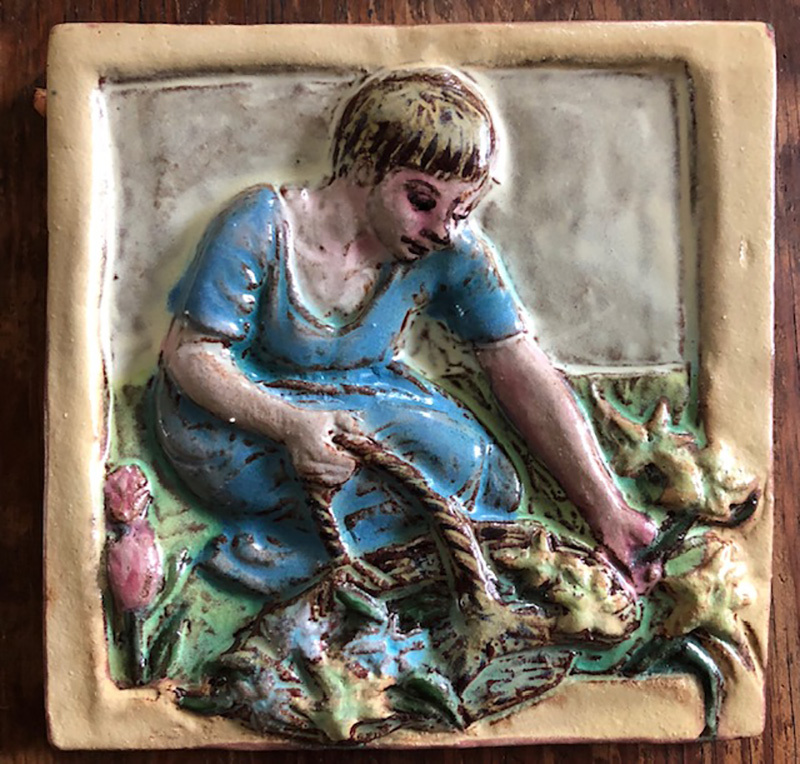 She sold her tiles at the Field Gallery and venues around Massachusetts and New York City. 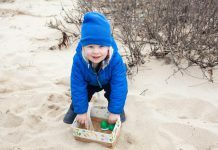 The Vineyard native took a break from her ceramic work in 2000 when she returned to the Island from Mattapoisett. 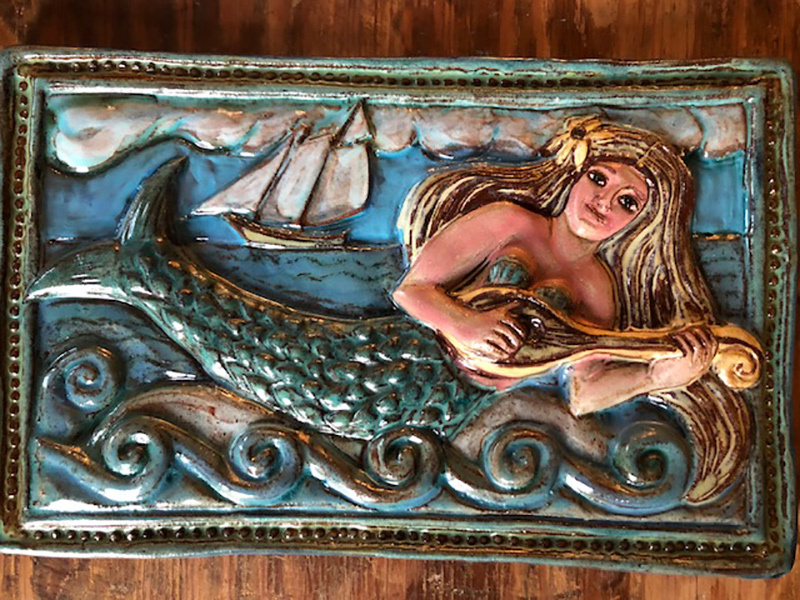 Among the newer tiles are scenes with mermaids, which have proven to be quite popular. 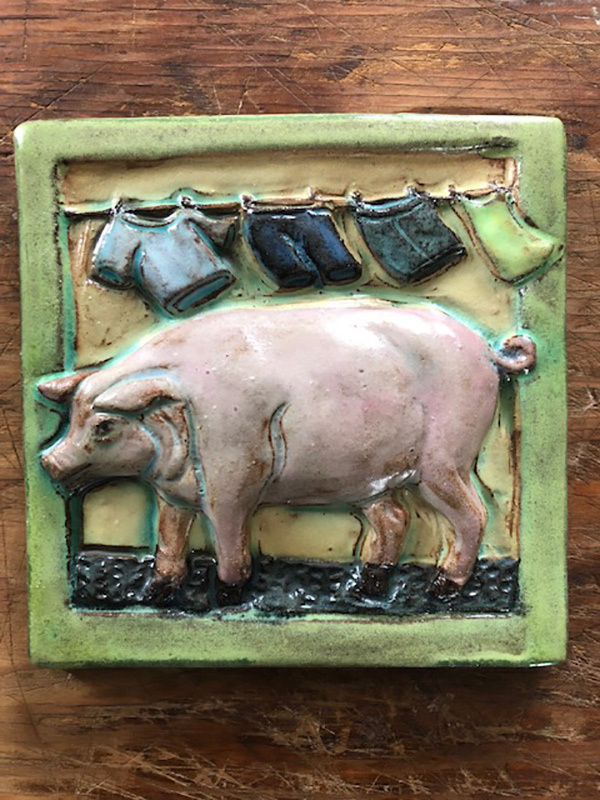 Goff uses press molds of her images to create the ceramic base, which she then paints with commercial underglazes for a layering effect, and finishes with details rendered using her own glaze recipes. Each tile is unique, utilizing a variety of colors. Goff will also be selling her more functional ceramic work at the new Chilmark Gallery. Paul Farrington’s passion for wood goes back to his days as a boatbuilder. “I came to the Island in 1989, and began as a very inexperienced boatbuilding apprentice,” he recalls. “I started making pieces out of some of the scraps because I saw some pieces of wood that were really striking. Those were fairly primitive construction. I did that for a decade. Now I’m making these again with almost three decades worth of added experience.” You can find examples of Farrington’s work at spiritoftreemv.com. The artisan keeps the natural shape of the wood slices, making for interesting formations that add to the overall organic look. These tabletop pieces are then set atop driftwood or reclaimed wood bases, creating true rustic, yet artistic appeal. Farrington only uses wood from trees that have either fallen down or have been taken down. “I love that they’re all local and being given a second life,” he says. Night Heron Gallery will open for the season on Friday, April 5, with a reception from 5 to 7 pm. The gallery will be open limited hours during the month of April, and return to seven days a week starting in May. 58 Main St., Vineyard Haven. 508-696-9500. 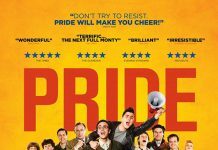 Next articleExtraordinary Lives of Ordinary People: A conversation with Dan Waters.